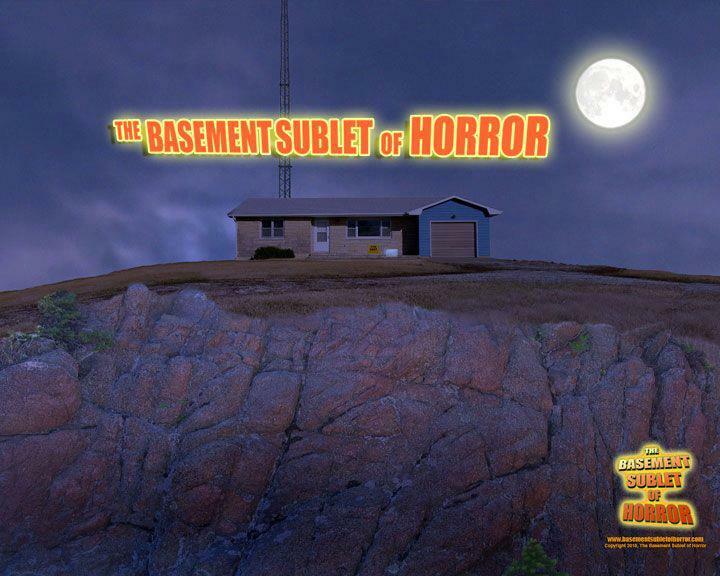 BASEMENT SUBLET OF HORROR: 10 Questions with Gunther Dedmund! Horror hosts come from all walks of life and from all corners of the United States (and beyond). America’s heartland is no exception and it is here, tucked down in his basement, where Gunther Dedmund lurks. Gunther has been entertaining folks in his native Kansas for ten years now and, if you’ve never heard of him, consider this an introduction of sorts. The Daves met Gunther at Horrorhound Weekend Indianapolis last March. The quiet and assuming host would later prove to be quite versatile – even creating a host group photo of those present at the event in lieu of one not actually being taken. 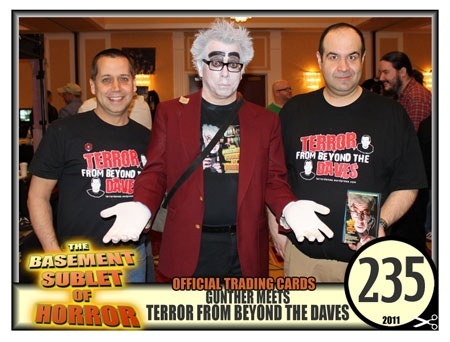 He honored us by giving our site the honor of distributing the photo and even further by including The Daves in his special Horror Host collector card set! As you’ll soon see, photography and technical skills are his forte.” While busy working behind the scenes in the creation of Horrorhound’s G.O.T.H.I.C. (Gathering of Television Horror Hosts Internet Cinema), Gunther took some time out and allowed us to interview him. DAVE: Tell us a little bit about your background and what lead you to become a Horror Host? GUNTHER: When I was in grade school, my Father brought home a 8mm projector and a single cartoon reel, from that moment I was hooked on films as well as projectors. My entire life has been spent either watching films, collecting 16mm films, re-editing old films into my own creations and also becoming a professionally trained projectionist. Since I grew up with horror hosts I always hoped to be able to become one. The name for my character Gunther Dedmund, came from a dream I had in 1983. In the dream I was watching a television show where the host was in a hovering desk mounted in a kind of flying saucer, the show was called “Gunther Dedmund’s Floating Spaceship”. The original concept I had was pretty involved and my plan was to show all types of movies, but due to an extreme lack of funds I decided to focus on one type of movies, horror films. After twenty years of collecting and editing films, my basement had become a ready-made set for a movie show. In 2005, Gunther Dedmund was dusted off. DAVE: Did you grow up watching any Horror Hosts and who would you site as your influences? 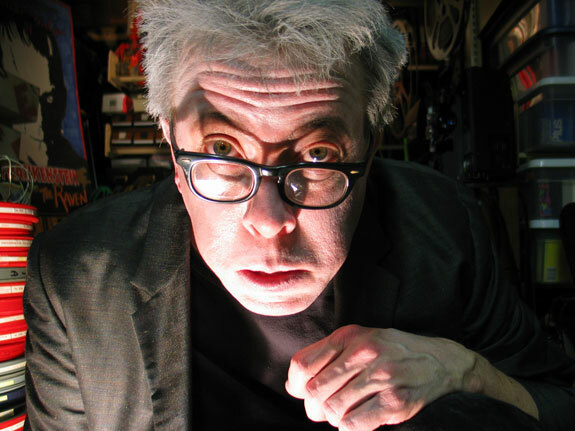 GUNTHER: My first exposure to horror hosting was from the local Wichita based horror host show “The Host and Rodney: Nightmare”, this show started in the late 50’s and continued on into the 70’s. I didn’t begin watching until the late 60’s when I was a kid, but it was a show of fairly good production values and the host, played by Tom Leahy, wrote all the scripts with elaborate dialogue almost worthy of a stage play. 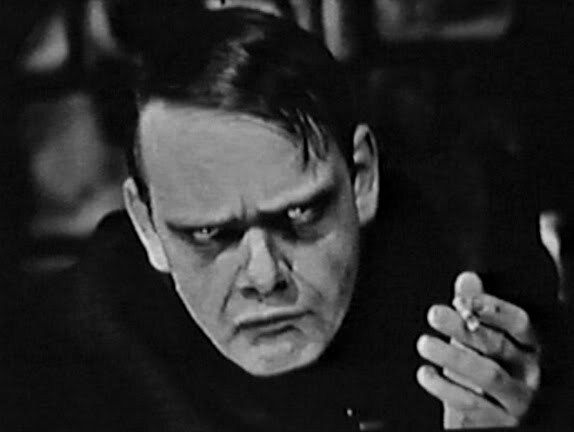 Since the show featured the early “Universal Shock Package” I pretty much grew up on the classics of horror, “Frankenstein” and the many sequels, Bela Lugosi’s “Dracula”, it was all wonderful material. DAVE: What were your favorite films growing up? 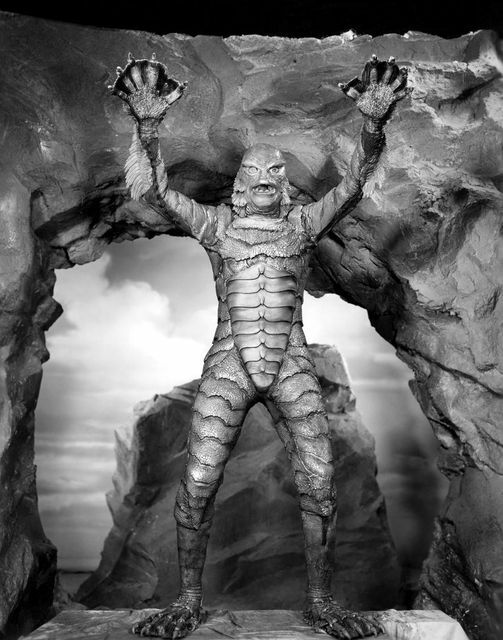 GUNTHER: Bride of Frankenstein, Metropolis, and Creature from the Black Lagoon. DAVE: Living in Kansas, you’re a bit cut-off from the other hosts in terms of geography. What kind of horror network or activities exist in your area? GUNTHER: There are a number of horror hosts in the state and cities around Lawrence, KS where I live such as Crematia Mortem, Evelle LeChat who lives in Arkansas but the producer of her show is from Lawrence so we team up for the local Halloween show on local TV. Since most of the hosts are centered in the large metro areas, it does make it harder to connect. I wish I could collaborate more directly with other hosts, or could travel to other host location to shoot shows with them. The internet has changed many things including the fact that geography is no longer an issue in connecting with horror hosts and those folks interested in this genre. DAVE: Tell us about the Basement Sublet of Horror. What is the premise of the show? GUNTHER: The Basement Sublet of Horror is based on my interest in vintage horror hosts especially “The Host and Rodney” . Instead of your typical castle setting, the show takes place in the basement apartment in a 1950’s Ranch style home. Gunther Demund has lives in the basement apartment and has resided there so long that his skin has turned white from lack of exposure to daylight. 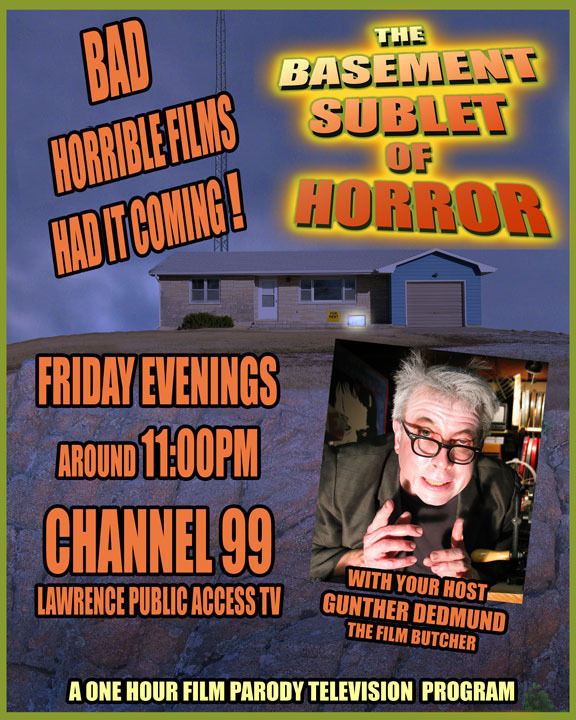 The basement is full of films from the 50’s and 60’s that Gunther shows twice a week on his public access TV show. 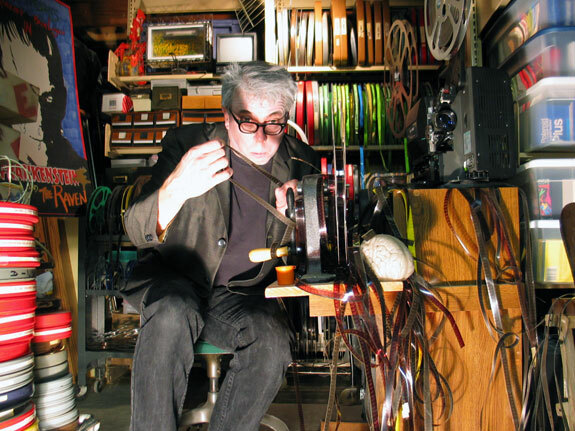 Gunther, “the film butcher”, also splices together movies to create his own versions of horror and sci-fy films for his show. In between movie segments, there are occasional appearances of neighbors, landlords, aliens, mind repair technicians, even musical guests. Gunther likes to think of his shows as a mix of education and entertainment. DAVE: Has your show had any notable sidekicks or guest appearances? 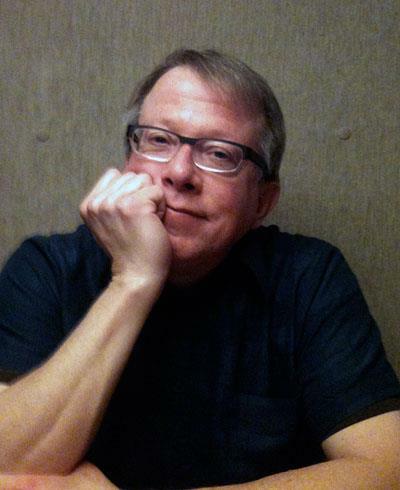 GUNTHER: There are no sidekicks (yet) and the most notable guest appearance has been by Scott Phillips author of the “The Ice Harvest” among other notable titles, who plays Gunther’s landlord. Other guests have included a telephone sales boss (Tim Manning) who forces Gunther into a sales position, Mr. Rule (Kc Stanton) who is the original grave digger who buried Gunther and insists on putting him back in his place, as well as other horror hosts Sigmund Zoid, Countess and Count Gregula, and author Michael Varatti via Gunther’s remote viewing television system. DAVE: After eleven years, and 135 episodes, what direction do you see your show going as it heads into its second decade? GUNTHER: Actually, I have produced 11 seasons in six years. I am productive in that I produce a lot of shows. Each season has roughly 12 -16 shows. The future of BSOH is going to include a broader thematic base and feature more obscure old films from my collection along with more variety of guests and musical performances. 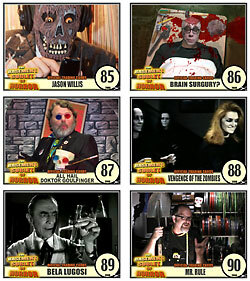 DAVE: You also created a hilarious Horror Host collector card set. Tell us about that and how people can order their own. 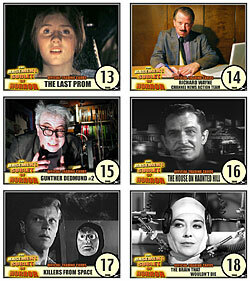 GUNTHER: Who doesn’t like collector cards? They are part documentation of the show, part marketing the show, part inside joke about collecting cards. The entire set is available to download for free from the Basement Sublet of Horror web site: www.basementsubletofhorror.com/freebies. DAVE: Among your many talents, you are also a gifted photographer. 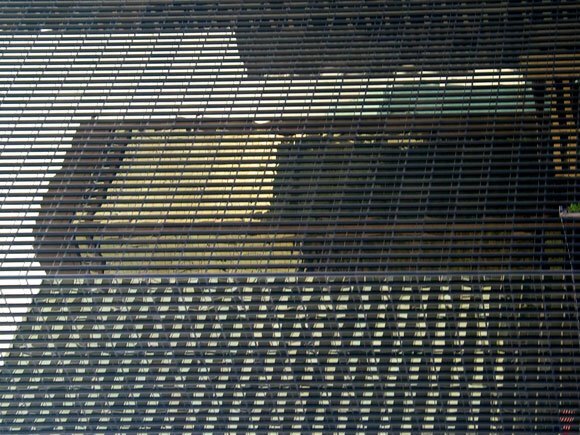 You appear to be particularly deft at urban/abstract photography which is not easy to master. Is this something you’ve been passionate about for a long time and has your work been shown professionally? GUNTHER: I started working with photography while in Junior High School iand became fascinated by Polaroid cameras, especially the portrait model camera that was used by Andy Warhol at that time. 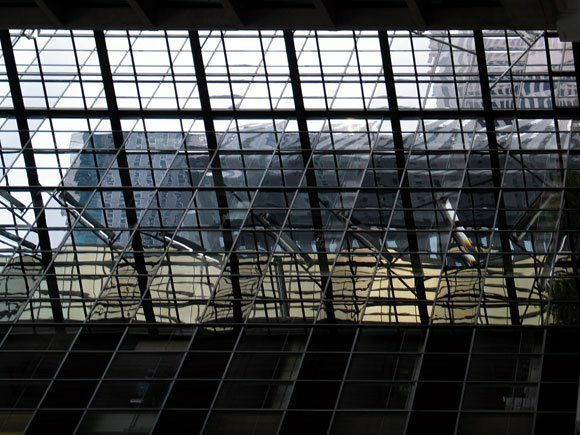 I experimented endlessly with the camera finding ways to alter the films developing processes to produce odd visuals. Early in the 80’s I borrowed an SX-70 camera from my girlfriend, now my wife, and this is when I really began shooting and finding the type of image that still attracts me to this day even though I work digitally now. My work has been exhibited regionally and in San Francisco. DAVE: We enjoyed meeting you at the last Horrorhound Weekend in Indianapolis. What has it been like congregating with other hosts at these amazing events? GUNTHER: It was great meeting both of the Daves as well and it was fun posing for the Scary Monsters horror host promo series. The horror host area of the convention has been kind of a mad house with so many people placed in one room together. One of my favorite experiences was meeting Cassandra Peterson, who said that I looked like the “illegitimate child of Andy Warhol and Bela Lugosi.” I also had a lot of fun teaming up with Count Gregula, to interview celebrities and hosts. 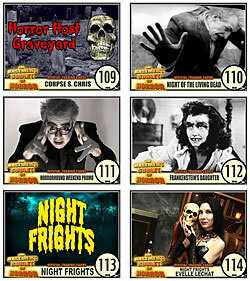 We recorded around four hours of footage during the 2011 Horrorhound event. However, nothing so far has come close to topping the Tribute to Vampira, that was one of the best horror host events ever staged. This entry was posted in Horror Hosts and tagged Basement Sublet of Horror. Bookmark the permalink. ← A HORRIBLE TIME ON TELEVISION: Horror Host poster to debut at Columbus Horrorhound Weekend!